The CommonWealth Bank of Australia (CBA) has updated is suite of mobile banking applications with native apps for the iPhone, iPad, Android, Windows Phone and the browser-based HTML5, with technology for near field communications (NFC) and social payments on the way. 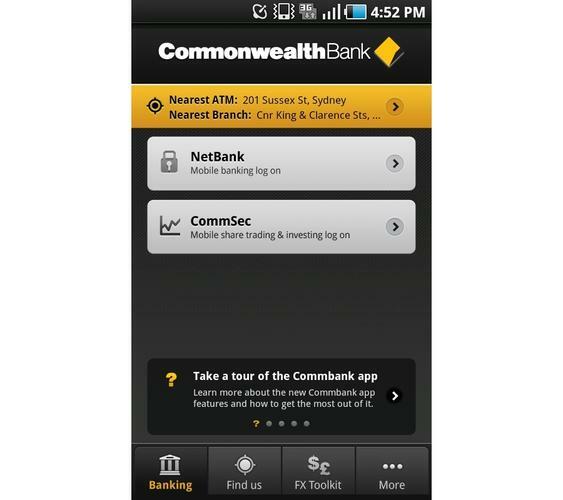 The new CommBank mobile banking app supports NetBank for standard online banking, CommSec for share trading, the CommBank Property Guide (iOS) and a new foreign exchange (FX) tool kit. The app also has native device capabilities including a nearest branch and ATM locator based on GPS and integrates the bank’s Twitter, Facebook and YouTube accounts. In addition to mobile and Web applications for regular account transactions, the CBA is also developing ways to facilitate payments with NFC and through social media and e-mail channels. The bank’s general manager of channel marketing, Andrew Murrell, said the phone is becoming an extension of the wallet. “We are looking at payment apps for social media and e-mail as it’s all about the digital ecosystem,” Murrell said. CBA’s chief marketing and online officer, Andy Lark, said the widespread adoption of NFC as payment method will depend on the availability of the technology in mobile handsets. Earlier this year Lark, in his previous role at Dell, said Apple’s iPad was not suited to the enterprise because of its closed ecosystem of hardware and software. Lark said CommBank’s mobile apps can be run natively on devices like the iPad or through the Web-browser where HTML5 will present much the same look and feel of a native app, but may not have all the features. Lark said the bank is seeing increasing traffic to its sites through tablets, which are already responsible for as many as 140,000 logins to NetBank every week. It’s been more than two years since the bank has overhauled its mobile banking interface and its first Android app was made available in February. Interest in mobile banking is certainly gathering pace with a 347 per cent growth in visits from mobile devices over the past 12 months – 95 per cent of which are from an iPhone or Android device. Tablets without a native app, like the new BlackBerry PlayBook can use the HTML5 interface, which Lark says gives a similar experience to a native app. The CBA claims to be the first local bank to have developed a Web-based Internet banking app optimised for tablets. The NetBank tablet app for iPad and Android devices is designed to use ‘tap’ features of tablets. The Windows Phone 7 app will available for download from Thursday, July 14.